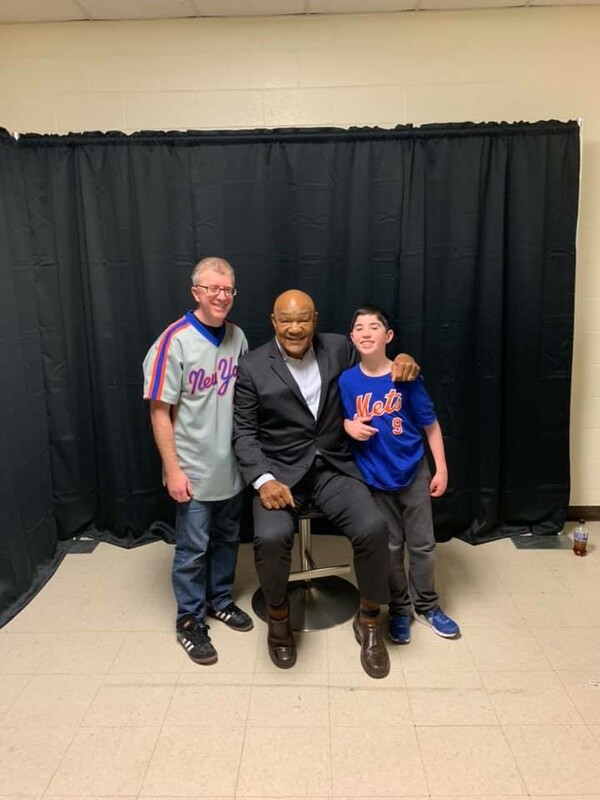 As someone who enjoyed collecting autographs and meeting old ballplayers means that I have a son who enjoys going to card shows and meeting current and former ballplayers. A few weeks back, my son, told me that he had one of the greatest weekends of his life. The reason? We met a ton of Hall of Famers like Chipper Jones, John Smoltz, Tom Glavine, Harold Baines, Bert Blyleven, and Trevor Hoffman. We also met former Mets greats Tim Teufel, Ray Knight and the guest of the very first That 401(k) Conference, Dwight Gooden. Of course, there was something for me, as I met one of my favorite boxers of all time, George Foreman. I spent a mint (someone’s paycheck) meeting and getting autographs from some of the greats of baseball and the Hanson Brothers, from the movie, Slapshot. While Jason likes to collect autographs, I will let you in on a secret. Most autographs that you collect from current, living former players will never appreciate in value. Why? It’s as simple as supply and demand. When you are looking at current and former stars, most have done countless signings and have signed thousands and thousands of autographs. Even someone that autographs cost a premium such as Derek jeter and Mariano Rivera have signed enough autographs to satisfy any demand. A Derek Jeter autograph will never be as valuable for a non-Hall of Famer such as Thurman Munson. Why? Thurman passed away and he wasn’t known as a frequent signer, as well as the fact that he died before the memorabilia craze that mushroomed in the 1980s. I have a friend of mine who worked for a very reputable sports marketing company and while he told me what a great experience these signings are, the items that I get aren’t going to appreciate much because there is ample supply. He once told me that he advised a family of a well-known Hall of Famer that they should stock autographs for a later date when that Hall of Famer passed away. That certain Hall of Famer passed away and you can get an autograph of this legend for less than $200. Certain players like Stan Musial and Ted Williams are gone, but their autographs can be had for way less than a mint. By the way, if you’re interested in an autograph, don’t buy unless it has authentication from someone reputable like PSA/DNA, JSA< Beckett, Steiner, Mounted Memories, and Fanatics. I don’t regret spending money on the autographs because I will have a connection with my son that I never had because my father wasn’t much of a baseball fan.